Friend s of Vietnam Heritage (FVH)-a non-formal group of foreign residents living in Hanoi who work voluntarily to promote and preserve Vietnamese cultural and historical heritage-will host a city walk for people to discover Hanoi on May 18. The English-speaking tour will start at 9.30am in front of the School of Pharmacy, originally the University of Hanoi, designed by French architect Ernest Hebrard. From there, the group will walk to the original French Concession of 1798 and then pass many of the major French buildings in the city, including the Hotel Metropole, the Opera House and the Museum of History. 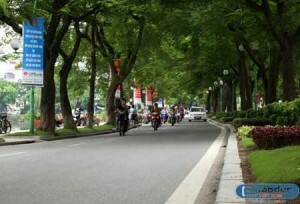 The guide will talk about the French expansion within Hanoi and its influence on architecture. The two-hour course, conducted in English, will show attendees an easy-to-make Vietnamese meal that not only tastes good but can help them stay healthy during Hanoi’s long summer. This session will be run as a cooking class, so you’ll get hands-on experience as well as insight from a cook who will share her 20-year experience in traditional medicine. The course will take place from 3-5pm at DG Cafeteria, No. 66, Lane 12 Dang Thai Mai Street, Tay Ho District.